Progress to the next level and explore a sweet candy world full of adventures. Clever switches and foresight are rewarded with cascading candy combos and tasty rainbow colored explosions. Plan your moves by matching 3 or more sweets in a column, row or in different shaped patterns. Use your boosters wisely to overcome tricky obstacles. Complete loads of levels and regularly come back for more. Sugar Burst Mania is free to play, though some in-game items can also be purchased for real money. 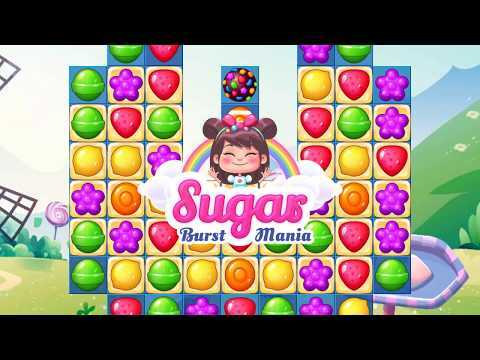 Sugar Burst Mania - Match 3: Candy Blast Adventure was added by playfulseagull in Mar 2019 and the latest update was made in Mar 2019. The list of alternatives was updated Apr 2019 There is a history of all activites on Sugar Burst Mania - Match 3: Candy Blast Adventure in our Activity Log. It's possible to update the information on Sugar Burst Mania - Match 3: Candy Blast Adventure or report it as discontinued, duplicated or spam. Alternatives to Sugar Burst Mania - Match 3: Candy Blast Adventure for Android, iPhone, Android Tablet, iPad, Web and more. Filter by license to discover only free or Open Source alternatives. This list contains a total of 25+ apps similar to Sugar Burst Mania - Match 3: Candy Blast Adventure. No reviews yet for Sugar Burst Mania - Match 3: Candy Blast Adventure, want to be first? Maybe you want to be the first to submit a comment about Sugar Burst Mania - Match 3: Candy Blast Adventure? Just click the button up to your right!